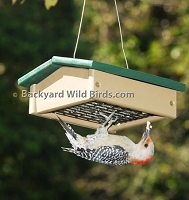 Recycled Bird Feeders will not fade, peel, rot, crack, or wrap. 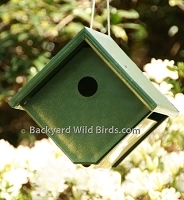 Go green with Recycled Bird Feeders that are made with rugged recycled plastics and thus are eco friendly and nature loving at the same time. 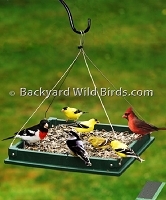 They come in variety of styles of bird feeders to deliver seed and suet for many different types of birds as shown below. There are also a recycled bird houses. 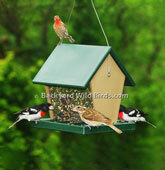 Oriole Fruit Jelly Bird Feeder in bright orange color attracts Orioles. This Oriole bird feeder holds more jelly than most fruit and jelly feeders and holds four orange halves. 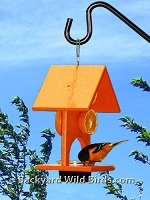 Oriole Orange Jelly Bird Feeder in bright orange color attracts Orioles. 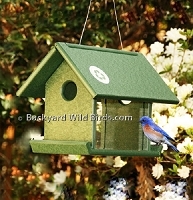 This Clear Roof recycled Oriole bird feeder holds two orange halfs and a bowl of grape jelly. 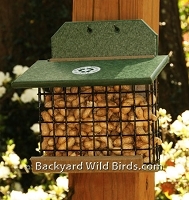 Go green with Recycled Bird Feeder that is made with recycled plastics and thus is environment friendly and nature loving at the same time.